1. A thermal envelope: this component is a quality insurance, but above all an asset to reduce energy costs. 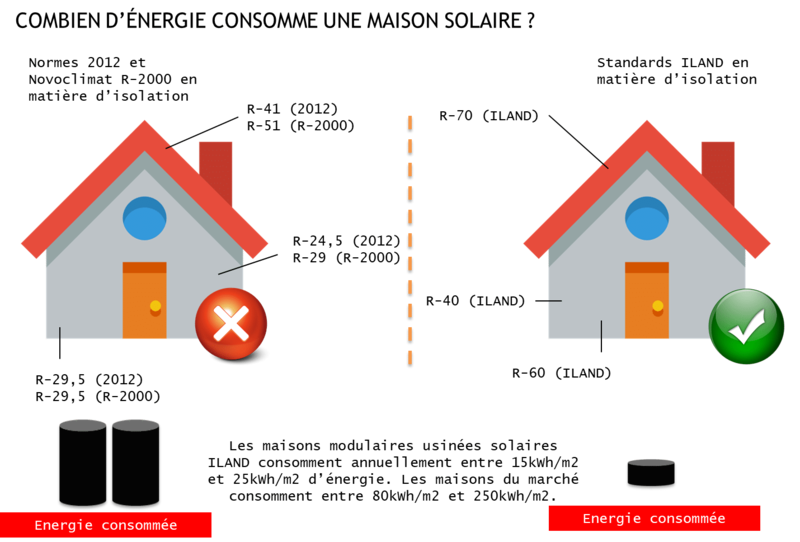 In fact, this type of house exchanges little energy with the outside; heating it is easy. In this case, all thermal bridges are cut off from the structure which prevents air infiltration. We also opt for triple-glazed windows that reduce energy losses. Our walls have at least R-40 thermal resistance our floors are R-60 certified and our ceilings are certified R-70. The thermal quality of the envelope reduces thermal losses both in the winter and in the summer. 2. Photovoltaic solar panels. These panels capture sunlight and turn it into electricity that will feed the power grid or that will be stored in battery systems. 3. 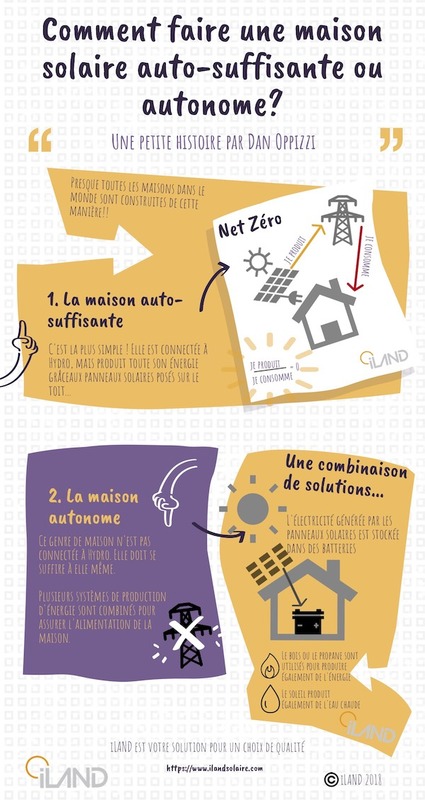 Solar thermal panels or water heaters. These solar panels capture heat from the sun to warm the glycol that circulates inside the panel. The glycol coil, installed in a closed circuit, passes through a tank that contains water and warms it up. The warm water from the tank will serve as hot water for the kitchen and bathrooms. Hot glycol can also be used for floor heating. 4. 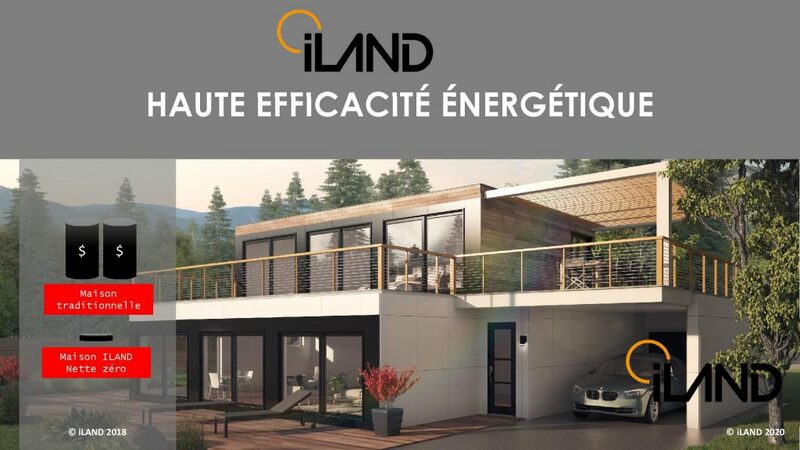 Solar thermal panels or solar wall.This type of solar panel captures the heat from the sun to warm up the air passing through the panel. The warm air is then fed directly into the house through the ventilation system. 5. Heat recovery ventilation or an air exchanger (HRV) allows air to be drawn directly from the outside and heated in contact with the inside air which is expelled when the air is renewed. This high-performance air exchanger will renew the air in the home without lowering the temperature inside the house. 6. A Canadian well. his invention, called a Provençal well in Canada, dates to Roman times. This type of well captures temperate air underground with a simple tube dug in the ground around the house. At a depth between 10 and 15 feet, the temperature is generally stable around 10 °C and 15 °C, therefore, in winter, the air drawn into the house is already warm. And by going through the HRV, an additional opportunity to save on heating costs is gained. 7. A wood stove or pellet stove. This system is installed in the house, either in the living room as an ornamental element or in the basement as the main system. This stove can be equipped with heat recovery units that are themselves connected to thermal solar panels. This set up produces heat at night or during periods of rain instead of the solar panels. 8. 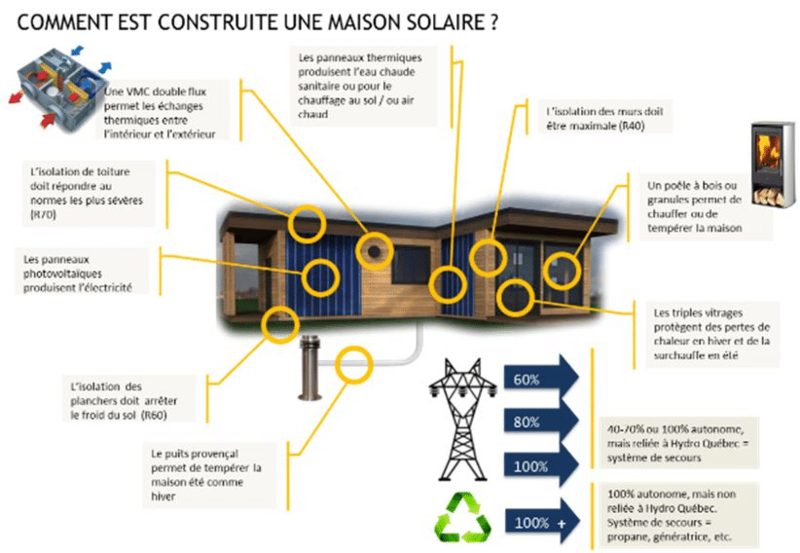 Other solutions such as geothermal energy, butane and biomass can still be used in a solar home as an auxiliary system to the main system. 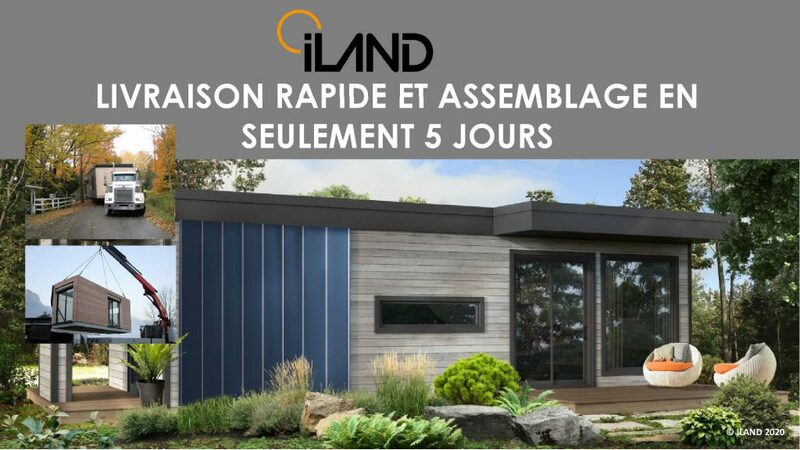 These should be based on the specific energy needs of the home and the lifestyle of the user, so that the home provides comfort to the user and the family without making being too complicated. 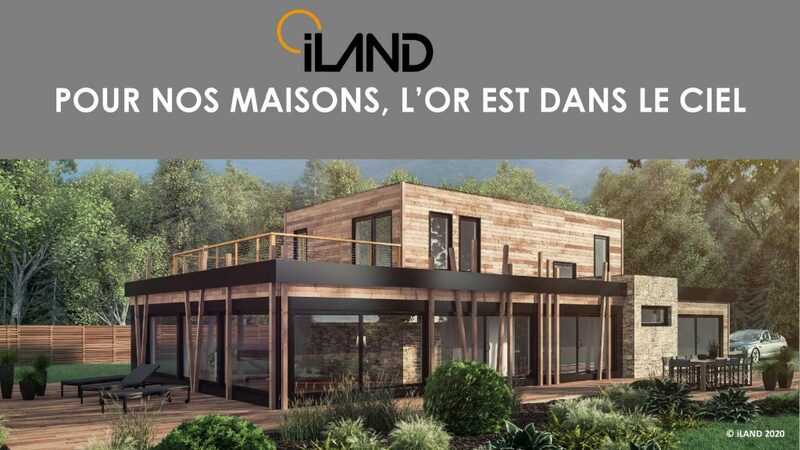 ILAND’s solar homes are entirely factory-built and transported directly to your land. They are habitable in 3 to 5 days. 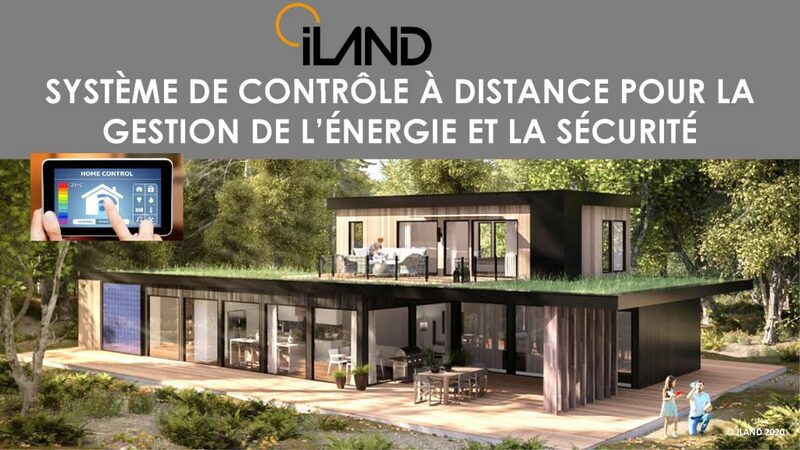 They are controlled by mobile phone and offer between 10 and 15 times more energy savings than a regular home on the market. All at market price! 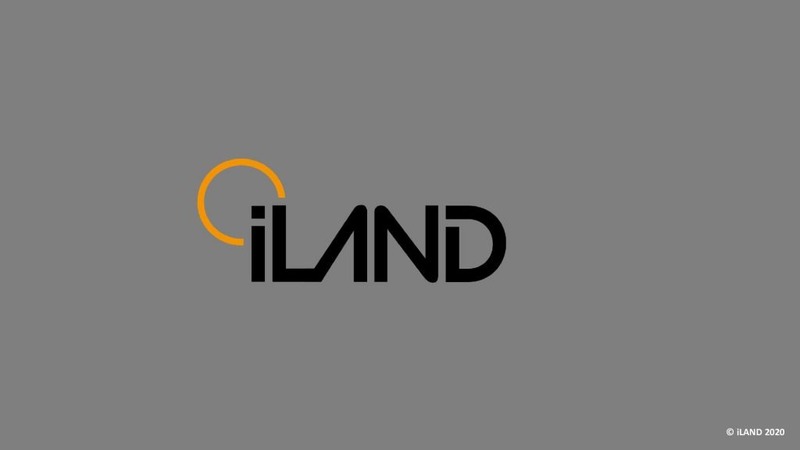 iLAND’s goal is to industrialize green solar homes to make them accessible to the consumer. 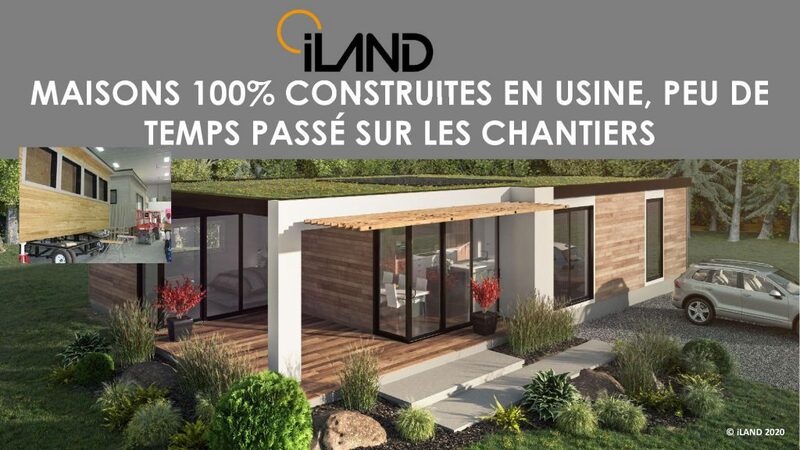 iLAND creates tomorrow’s housing TODAY! The objective is to get rid of construction sites. Building houses on a job site poses many problems, particularly because of the weather. 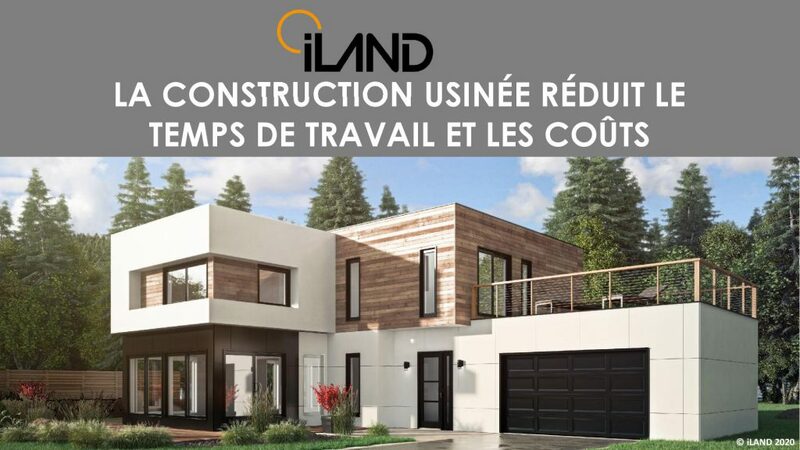 In addition, coordinating contractors, delays, difficulty in finding skilled labor, long winters, wet summers, etc., make construction on a job site an endeavor that is often difficult to manage and to control the costs of. “home automation.” It controls your home when you are out. “i” for intelligent, “Land” for space! 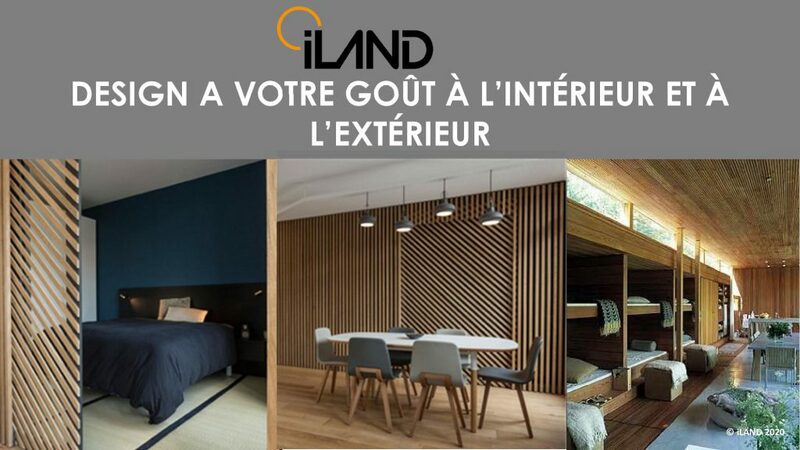 An iLAND house is literally an intelligent space! 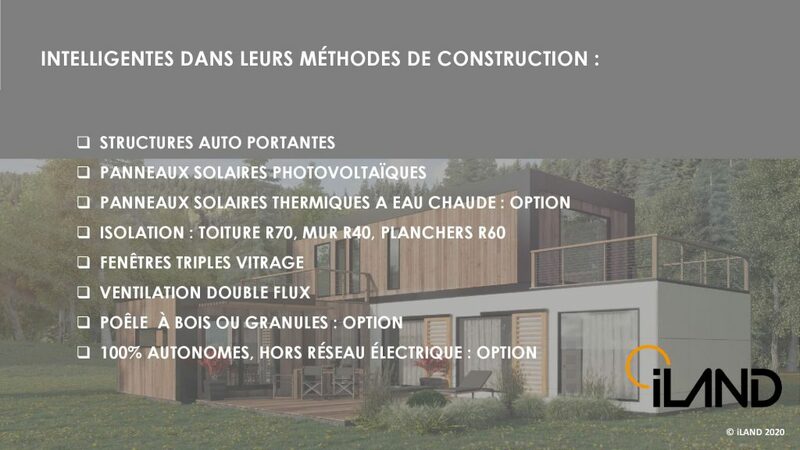 Smart homes in their construction methods. 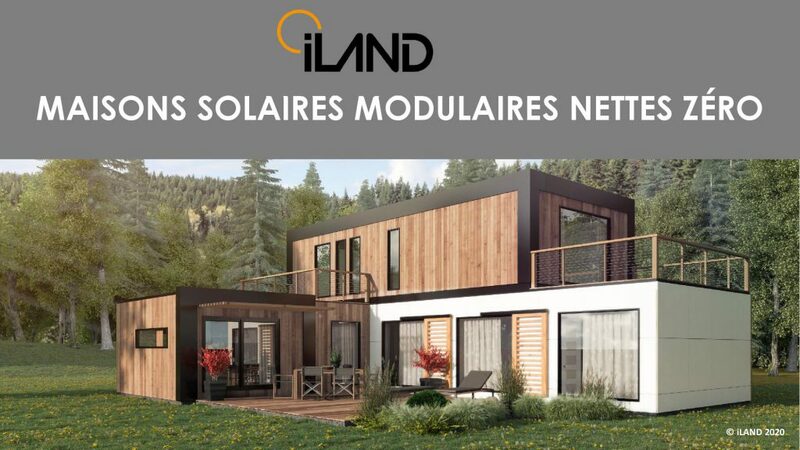 The houses are made of self-supporting structure modules. They are energy efficient and use solar technology. Heating cost NOTHING. NEVER receive exorbitant bills again! 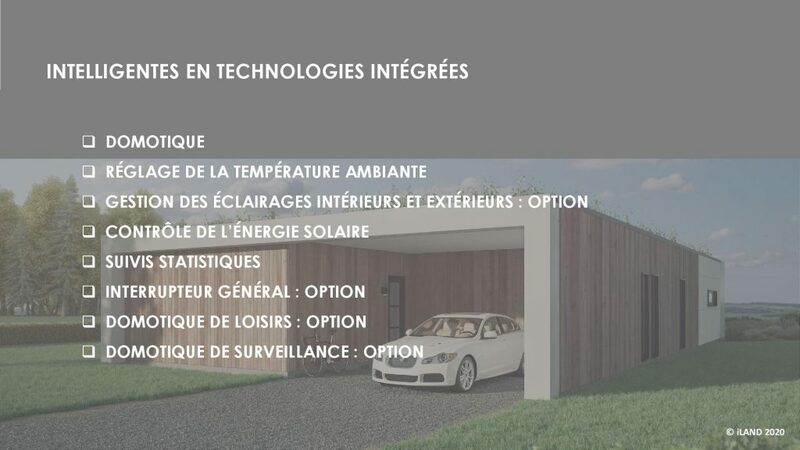 Smart homes in their composition. 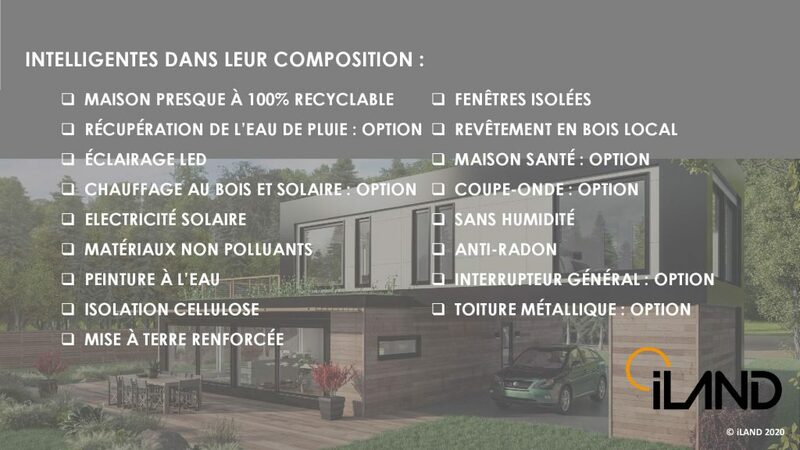 Our homes are almost entirely recyclable as they do not contain polluting or toxic materials. 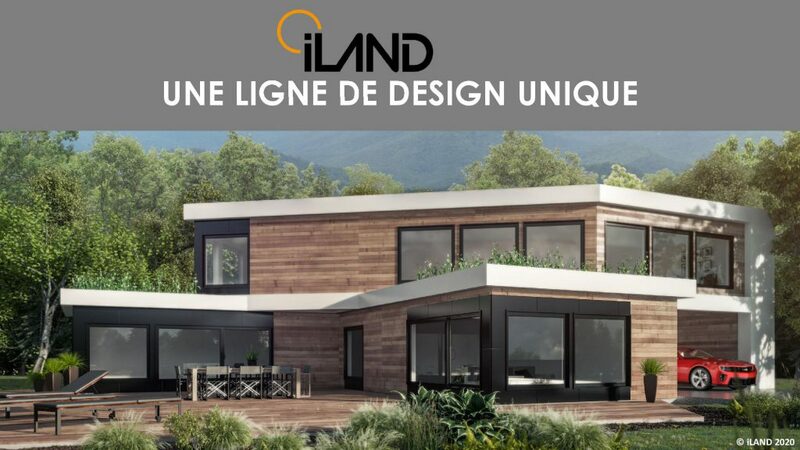 The insulation is environmentally friendly and the triple-glazed windows and the interior finishes are made of noble materials such as wood and ceramics.